The Aptitude Compound Interest online Mock Test is Very helpful for all students. Now Scroll down below n click on “Start Quiz” or “Start Test” and Test yourself. What is the difference between the compound interests on Rs. 5000 for 1.5 years at 4% per annum compounded yearly and half-yearly? 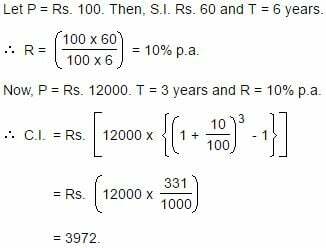 If the simple interest on a sum of money for 2 years at 5% per annum is Rs. 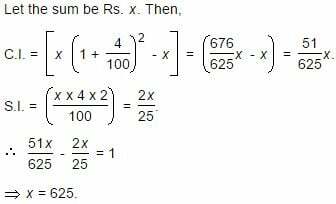 50, what is the compound interest on the same at the same rate and for the same time? III. 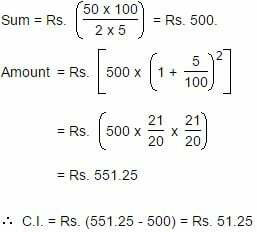 Simple interest earned per annum is Rs. 2000. 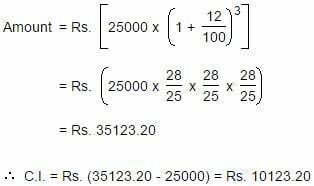 What will be the compound interest earned on an amount of Rs. 5000 in 2 years? I. 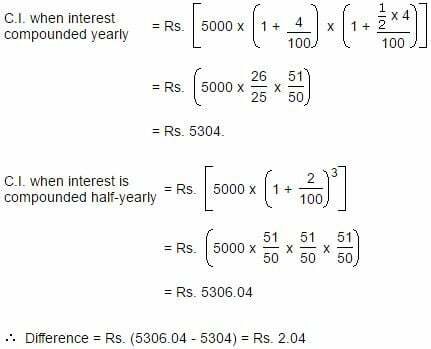 The simple interest on the same amount at the same rate of interest in 5 years is Rs. 2000. II. The compound interest and the simple interest earned in one year is the same. III. The amount becomed more than double on compound interest in 10 years. 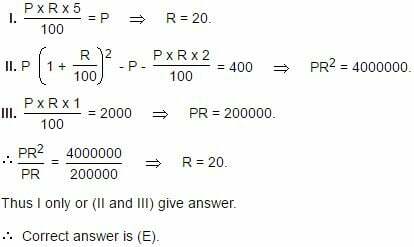 P = Rs. 5000 & T = 2 years. I. S.I. on Rs. 5000 in 5 years is Rs. 2000. 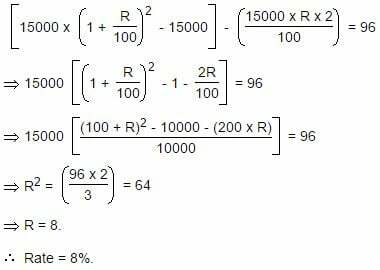 5000 × R × 5/100 = 2000 ⇒ R = 8. Thus I only gives the answer. In each of the following questions, a question is asked and is followed by three statements. While answering the question, you may or may not require the data provided in all the statements. You have to read the question and the three statements and then decide whether the question can be answered with any one or two of the statements or all the three statements are required to answer the question. 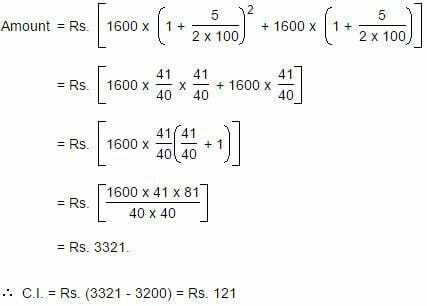 The answer number bearing the statements, which can be dispensed with, if any, while answering the question is your answer. Again, II gives S.I. for 2 years = Rs. 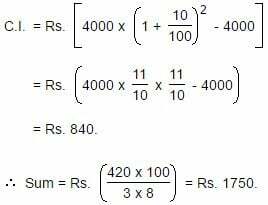 (600 × 2) = Rs. 1200. Now, from III, Sum = Rs. (10 × 1200) = Rs . 12000. 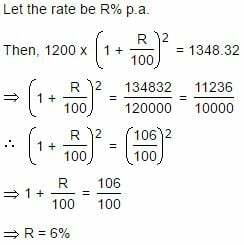 Thus, Rate = 100 × 1200/2 × 12000 = 5% p.a. II. The rate of interest is 10 p.c.p.a. III. 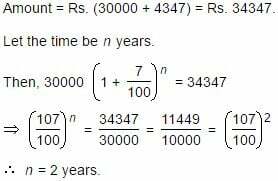 Compound interest for 3 years is more than the simple interest for that period by Rs. 465. III. gives, (C.I.) – (S.I.) = Rs. 465. 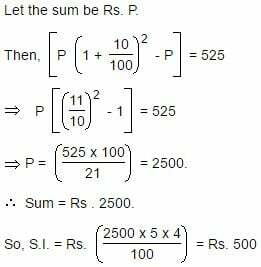 Also, from I and II, we get sum = (100 × 4500/10 × 3) = 15000. ∴ Either II or III is redundant. 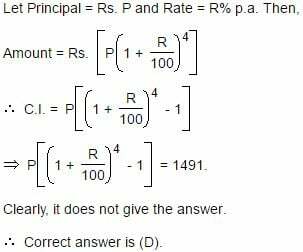 What is the rate of compound interest? I. The principal was invested for 4 years. II. The earned interest was Rs. 1491.